Is my toddler a late talker? We have extensive training and experience in providing speech therapy to young children who are not yet talking or “late talkers.”. Through meaningful and engaging opportunities, children learn words associated with the world around them. Our therapists are trained in programs specifically for working with “late talkers” such as “Target Word” and “It Takes Two to Talk.” Individualized therapy and specific suggestions for carryover throughout the week are provided following each session. Our compassionate and engaging therapists make therapy fun and meaningful for your little one! Is My Toddler a “Late Talker”? Has relatively good understanding, play, social motor, and cognitive skills. ______ Was your child quiet as a baby? ______ Did your child have reoccurring ear infections? ______ Is there a family history of speech, language, or academic difficulties? ______Does your child imitate sounds? ______ Does your child engage in limited sequenced pretend play? ______ Does your child have a vocabulary consisting of mostly nouns with little or no verbs? ______ Does your child have difficulty communicating with peers? ______Does your child use limited use of gestures? ______ Does your child make a limited number of sounds? Preschoolers may struggle with a variety of aspects of language. These can include vocabulary, grammar (syntatx), phonics, early literacy skills, social skills (pragmatics) and retelling a story (narratives). We use fun and play-based activities to target the area(s) of language your preschooler is having difficulty with. By implementing mult-sensory learning, we make learning engaging and fun! Children begin building their narrative skills early in life. When a child tells you about an event that happened to them, they are telling you a narrative. As they start to build an autobiographical memory, they develop self-regulation skills. We can help children build their autobiographical memory through meaningful and engaging activities. 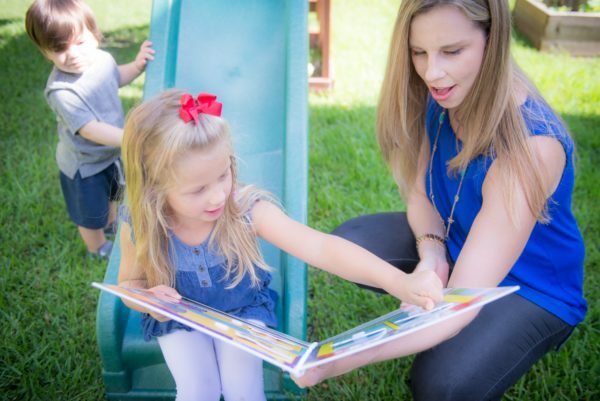 Our Early Childhood Literacy Therapy uses engaging stories and hands on activities to help children develop meaningful associations with the vocabulary and story. Check if your child can hear. See if she turns to noises or looks at you when you talk. Pay attention to ear problems and infections, and see your doctor. Respond to your child. Look at him when he makes noises. Talk to him. Imitate the sounds he makes. Laugh when she does. Imitate the faces she makes. Teach your baby to imitate actions, like peek-a-boo, clapping, blowing kisses, and waving bye-bye. This teaches him how to take turns. We take turns when we talk. What can I do to help my toddler? Use short words and sentences that your child can imitate. Use correct grammar. Play with sounds at bath time. You are eye-level with your child. Blow bubbles, and make the sound “b-b-b-b.” Pop bubbles, and make a “p-p-p-p” sound. Engines on toys can make the “rrr-rrr-rrr” sound. Read to your child every day. Try to find books with large pictures and a few words on each page. Talk about the pictures on each page. Ask your child to name pictures. He may not answer at first. Just name the pictures for him. One day, he will surprise you by telling you the name. Teach your child new words. Reading is a great way to do this. Read books with short sentences on each page. Talk about colors and shapes. Practice counting. Count toes and fingers. Count steps. Name objects, and talk about the picture on each page of a book. Use words that are similar, like mommy, woman, lady, grown-up, adult. Use new words in sentences to help your child learn the meaning. Put objects into a bucket. Let your child remove them one at a time, and say its name. Repeat what she says, and add to it. Help her group the objects into categories, like clothes, food, animals. Cut out pictures from magazines, and make a scrapbook. Help your child glue the pictures into the scrapbook. Name the pictures, and talk about how you use them. Look at family photos, and name the people. Talk about what they are doing in the picture. Write simple phrases under the pictures. For example, “I can swim,” or “Happy birthday to Daddy.” Your child will start to understand that the letters mean something. Sing songs, play finger games, and tell nursery rhymes. These songs and games teach your child about the rhythm and sounds of language. .What can I do to help my preschooler? Talk about where things are in space, using words like first and last or right and left. Talk about opposites, like up and down or big and little. Give your child clues, and have him guess the object. Talk about categories, like fruits, furniture, and shapes. Sort items into categories. Have your child tell you which item does not belong. Talk about why it doesn’t belong. Let your child tell you how to do something. Pay attention when your child speaks. Respond, praise, and encourage him when he talks. Get his attention before you speak. Pause after speaking, and let him respond to what you said. Teach your child to ask for help when she does not understand what a word means. Point out objects that are the same or different. Talk about what makes them the same or different. Maybe they are the same color. Maybe they are both animals. Maybe one is big and one is little. Act out stories. Play house, doctor, and store using dolls, figures, and dress-up clothes. Have the dolls talk to each other. Read stories that are easy to follow. Help your child guess what will happen next in the story. Act out the stories, or put on puppet shows. Have your child draw a picture of a scene from the story. You can do the same thing with videos and TV shows. Ask who, what, when, where, or why questions about the story. Play game like “I Spy.” Describe something you see, like, “I spy something round on the wall that you use to tell the time.” Let your child guess what it is. Let your child describe something he sees. This helps him learn to listen and to use words to talk about what he sees. Give your child 2-step directions, like “Get your coat from the closet and put it on.” Let your child tell you how to do something. Draw a picture that he describes. Write down your child’s story as she tells it. Your child will learn the power of storytelling and writing. Play board games with your child. This will help him learn to follow rules and talk about the game. Have your child help you plan daily activities. For example, have her make a shopping list for the grocery store. Or, let her help you plan her birthday party. Ask her opinion, and let her make choices.